In 1978, when I was setting up to build my first boat, I needed to start accumulating tools. My shop was a temporary shed in the back yard of the house I grew up in, so my dad’s tools were available, but the only power tool he had was an electric drill. As a kid, I’d been able to get by with his tools making forts along the back fence, two bunkbeds for myself, and a darkroom in the garage, but they weren’t going to suffice for boatbuilding. The boat I started with was a dory skiff, and the limitations of Dad’s handsaws, hammers, and chisels came into sharp focus when I tried shaping its curved stem from a piece 2″-thick white oak. After I had traced the shape, I made dozens of short cross-cuts up to the line, whacked out the blocks in between with a chisel and a hammer, then finished up with a rasp and a file. It was painfully slow work, and I was pretty sure that if I ever finished the boat I’d never build another. One of these once-ubiquitous ads for Gilliom kits led me to building my first bandsaw. 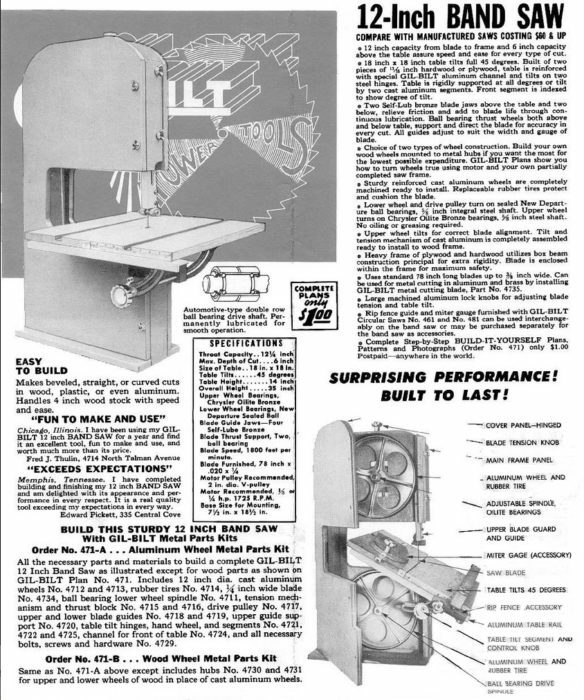 In one of the do-it-yourself magazines I liked to read, I saw an ad for a bandsaw built from a kit. It had the necessary metal pieces; all I had to do was make the plywood and lumber frame. I mailed my order with a check for around $35 to Gilliom Manufacturing in St. Charles, Missouri; when the plans and parts arrived I built the frame, installed the metal parts, added a 1/3-hp electric motor, and I was in business. There was nothing fancy about the bare plywood bandsaw, but it got the dory project moving along at a satisfying pace and I began to enjoy the work. I finished the dory skiff and a few months later began building a second boat, a gunning dory. Dad was always involved with rowing and did a lot of repairs to wooden racing shells in the garage. It didn’t take him long to see the value of my bandsaw. He often had to replace shoulders, the ash diagonals in the cockpit that span the keelson, inwales, and washboards and anchor the outriggers. They have a complex shape, and while he could make them using a backsaw and a coping saw, he could do the work in a fraction of the time on my bandsaw. 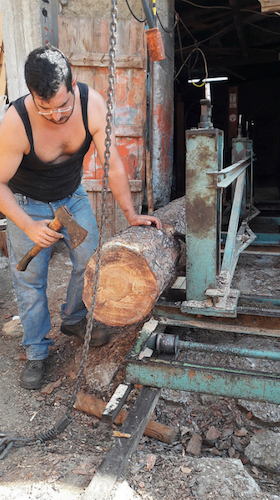 He ordered a Sears Craftsman 12″ bandsaw, the first standing power tool he had ever owned. Despite its thin cast-metal back and a molded plastic cover, it lasted for decades in his shop, and after Mom died and Dad sold the family home, he took the bandsaw to the shop at the Lake Washington Rowing Club where he continued to work on shells. Dad passed away a few years ago and his bandsaw has since moved on from the club, but I believe it’s still working, headed for 40 years in operation. 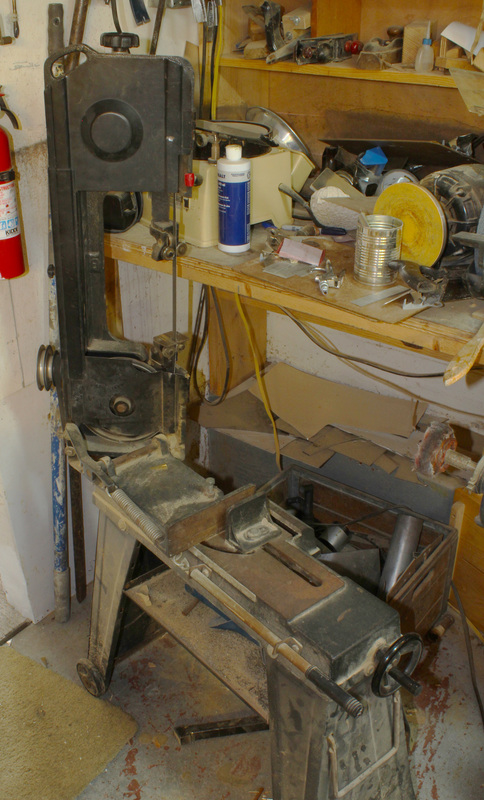 In the early ’80s I built a cabin/shop in the woods in the Cascade Mountains and took my Gilliom bandsaw with me. I was 17 miles off the grid, so I powered the bandsaw with a gas engine salvaged from a lawn mower. I kept the saw by a large door so I could get rid of the exhaust fumes when I had the bandsaw fired up. I built a kayak and a sneakbox while I was in the mountains, then moved out in the middle of my second winter to take up residence in a cabin on Lopez island in Washington’s San Juan Archipelago. 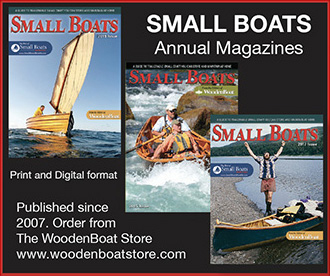 While I was on the island I built a half dozen flat-bottomed rowing skiffs for a summer camp. I’ve been using this 14″ bandsaw for about 30 years. It’s on casters to make it mobile and the vacuum cleaner doing the dust collection is an Electrolux that my mother bought around 1960. I remember the day the door-to-door Elextrolux salesman paid us a visit. To demonstrate the vacuum’s power he attached a clear plastic tube to the hose nozzle and sucked up three solid steel balls, one after the other, off the floor straight up into the tube. It still has enough oomph to gather dust. In 1987, I moved to Washington, D.C. and got a job working for the Smithsonian Institution. I could afford to buy a bigger bandsaw, one that would last a lifetime, because I didn’t see an end to my building boats. I bought a 14″ Delta, a solid machine with a heavy frame and smooth-running wheels. While I was in D.C. I built an 18′ tandem decked lapstrake canoe in the basement of the rental house. When I returned to Seattle in ’89, I took the Delta apart and shipped it ahead by rail. In my new home I had only a small one-car garage for my shop, so there was little room for non-essential tools. I retrieved the Gilliom that I’d left with my parents, scrapped the wood, and saved all of the metal parts, mostly for sentimental reasons. Over the years they’ve all drifted away and there’s nothing left. With the Delta I built only one boat in that garage, an 8’ rowing skiff for my infant son. It was afloat only once before becoming a backyard plaything, and ultimately was converted to a bookcase. My second 10″ Homecraft bandsaw, a curbside rescue, needed a bit of attention. Behind it is my first 10″ Homecraft, and to its right, my 14″ Delta. In my current home, I’ve had lots of room for tools. 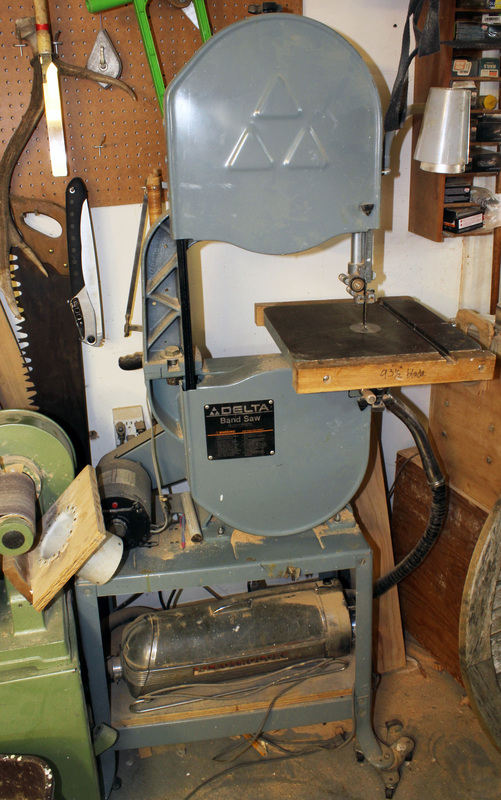 I happened upon a 10” Delta-Rockwell Homecraft bandsaw at a yard sale. I bought it and put it to work with a thin blade for curved cuts, leaving the Delta with a wide blade for resawing and heavy work. A few years later I was driving to work one morning and saw another 10″ Homecraft out by the street with a “FREE” sign on it. It was rather rusty and missing its lower blade guard, but it had a solid stand and a working motor. The blade on it was a 1/2″-wide hook-tooth with an aggressive three teeth per inch. When I got everything cleaned up and made a new blade guard, I was pleased how well this new addition to the shop worked. In spite of its small size, it has an enormous appetite for wood. I keep the same kind of blade on it and use it for slabbing crooks into knees and locust windfalls into stock for cleats. While it’s said that the poor man owns many boats, the rich man but one, I’ve come to believe the inverse is true of bandsaws. My metal-cutting bandsaw isn’t much to look at and has a cheap, wobbly base, but it has a lot more patience than I do. 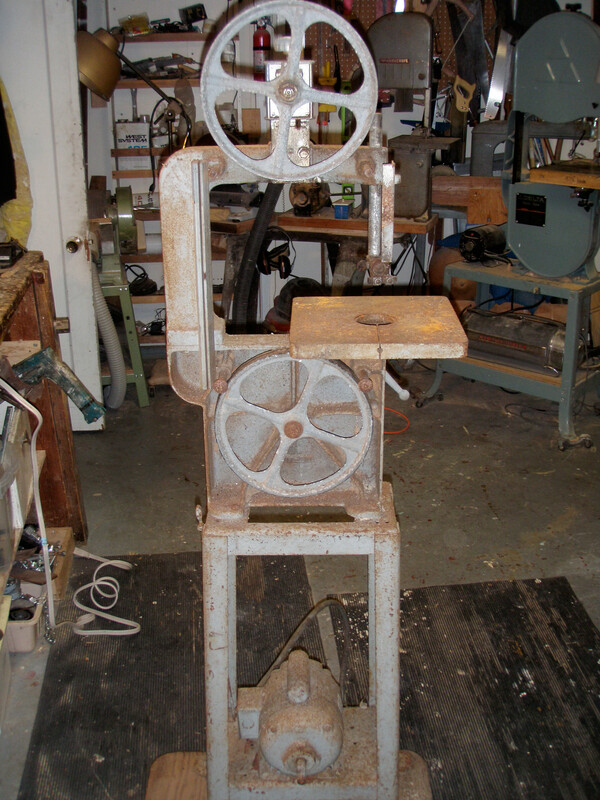 The last bandsaw to come into the shop, a metal-cutting bandsaw, was another yard-sale buy. After I get the working stock clamped in, it does its work by itself so I can tend to other tasks. When it’s done I hear the cut-off ring as it drops to the concrete floor; the saw turns itself off. With its help, I’ve grown more ambitious with my metalworking projects and have made a few sets of pintles and gudgeons and wood stoves for the two boats with cabins. I didn’t plan on becoming a boatbuilder. The only reason I built my first boat was that I didn’t have enough money to buy one, and I bought the bandsaw kit as a way to avoid the tedium of working with hand tools and just get the job done. But that first bandsaw turned me from someone who wanted a boat into someone who wanted to build boats. Of all the bandsaws I have known, I own the one that came to me, a Grob. You haven’t found a use for the powered saw or the multiple blades that I find a use for. But in the long run I couldn’t live without mine. My first bandsaw was an 18″ Gilliom. Worked quite well, but was really a light-duty saw. I beefed it up, mainly the upright column plus added bracing for the top wheel support, which improved it. When I needed to cut out quite a few identical parts from a bronze water tank for a project, I put in a jack shaft and step pulleys, plus a metal-cutting blade, and it worked quite well in this mode. Eventually I sold that saw, and got a Grizzly 18″ (older style, with the cast-iron frame), and a Grizzly 14″ with the express purpose of converting it to a metal-cutting machine. I use it a lot, with 1/4″ variable pitch bi-metal blades that will cut bronze, mild steel, and even stainless. The blades last a long time. It will cut wood, too, but of course very slowly with its approx. 400 fpm. I don’t like it for aluminum as the fine teeth clog easily. Just cut the aluminum on your woodworking bandsaw with a regular wood-cutting blade. A table saw with a woodworking blade works fine too for straight cuts. Don’t raise the blade any higher than you need and wear 16 kinds of eye protection. Those aluminum chips are hard to get out of your eye with a magnet!! 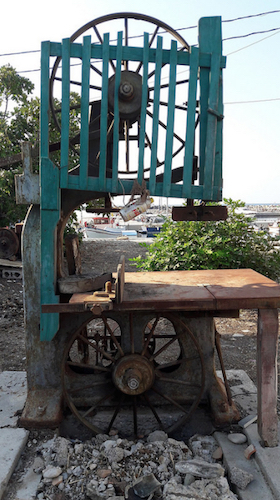 I’ve only owned one bandsaw, a 32″ Crescent that was an antique when I bought it about 40 years ago, when I started boat building. It has a 2-hp repulsion/induction motor, a replacement for the original of the same style. I have cut knees and breasthooks out of tree branches, resawn many thick chunks, cut frozen hams and turkeys (makes the saw run smooooth), and still use it all the time. Paid $150.00 for it.